Tucked away on the piney shores of Lake Vermilion is a family cabin with a design issue. The owners were frustrated by a steep stairway, reminiscent of a ladder to a sleeping loft. The handholds were inadequate and had a tendency to give one splinters. 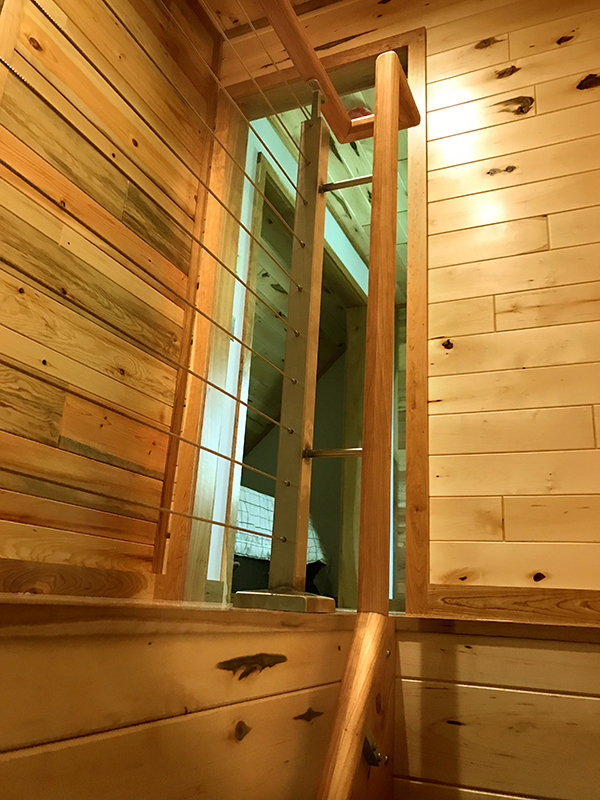 The nearly vertical incline of the staircase reminds one of a ship’s ladder. At Meteek our goal is to provide custom design solutions that not only fit your life, but that fit challenging spaces as well. We had a great time finding solutions to this ladder-like stairway. 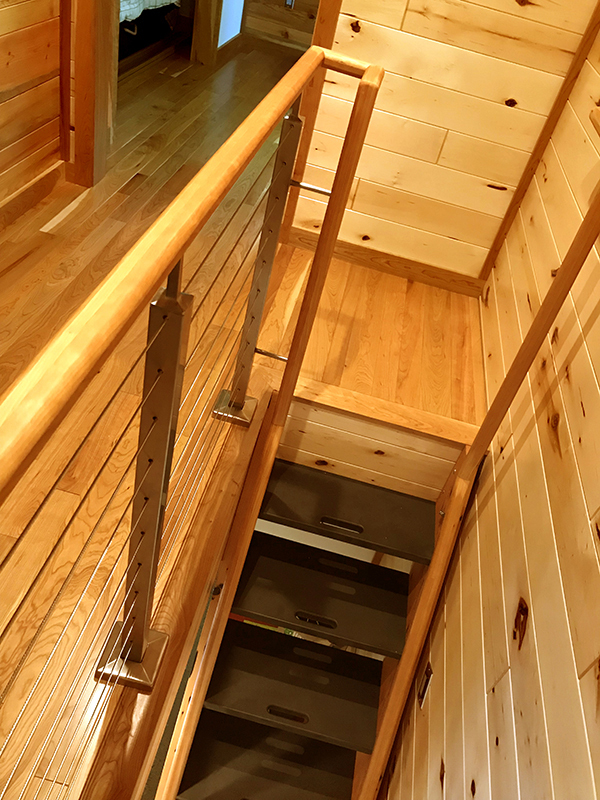 We refitted the stringers with new treads and created a double railing based on the design of a ship’s ladder stairway (click here for more on ships and railings!). Durability, sleek design and safety—a winning combination. Andy removed the original stairway, brought it back to Meteek and performed a few wonders. 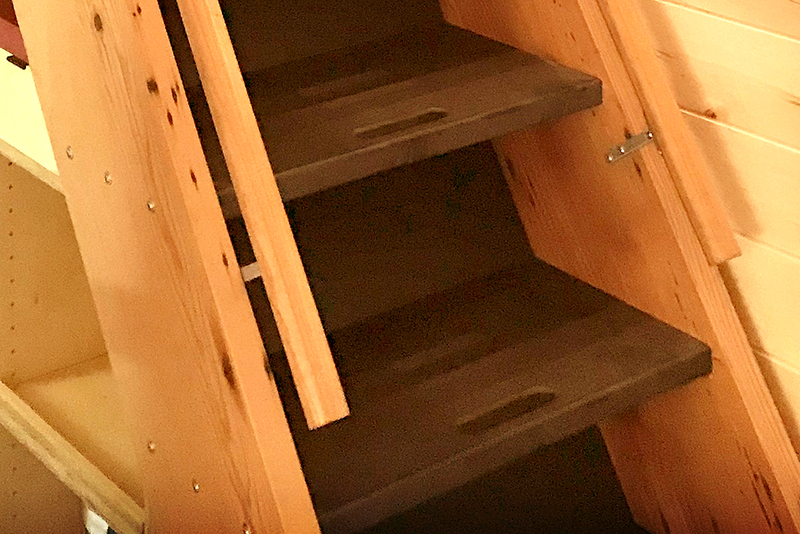 He replaced the stringers and removed the cleats beneath the stairs, creating a splinter-free zone. The steps themselves are durable Richlite. Handholds cut at the front of each stair make it an easy climb for children. 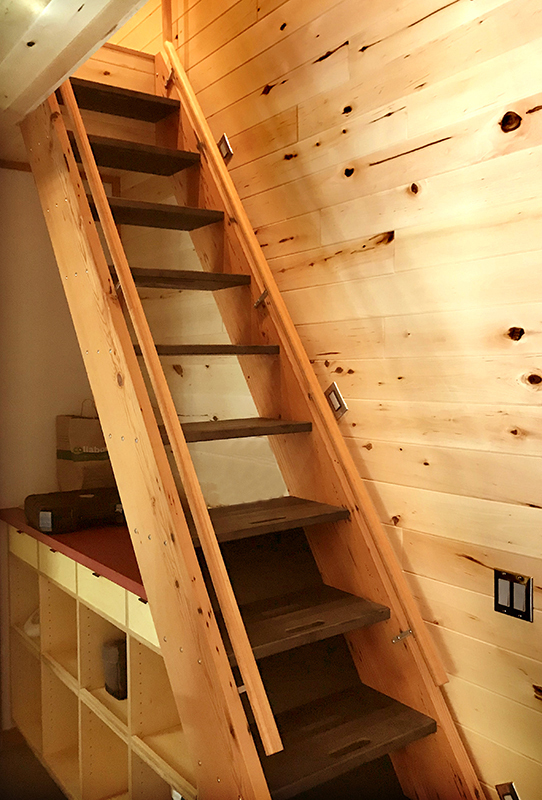 Handholds cut at the front of each stair make it an easy climb for children. Meteek’s Andy Hoffman is a wizard when it comes to creating custom pieces. 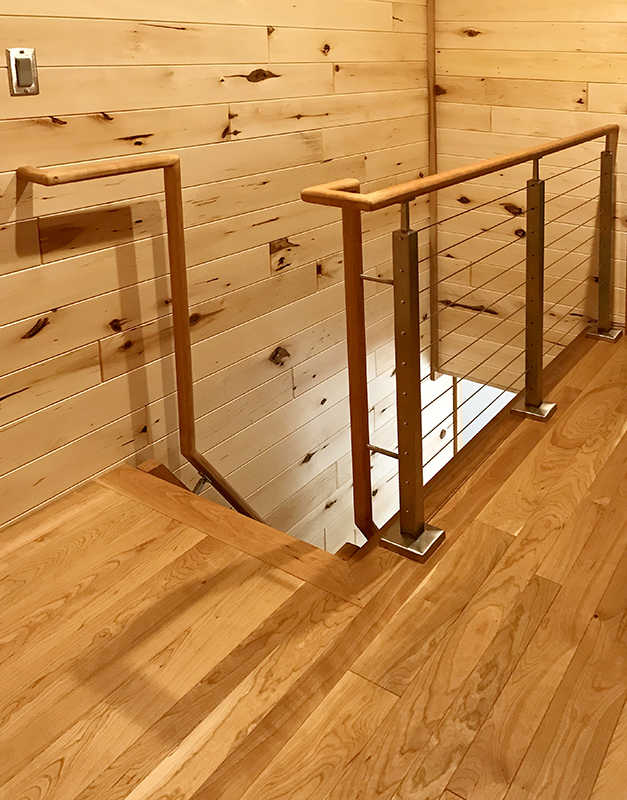 After carefully measuring the space, Andy crafted each piece in our shop and built the railings with all the twists and turns necessary for the small space. He transported the pieces back to the site and expertly assembled them to fit the of the upper railing. Brilliant! 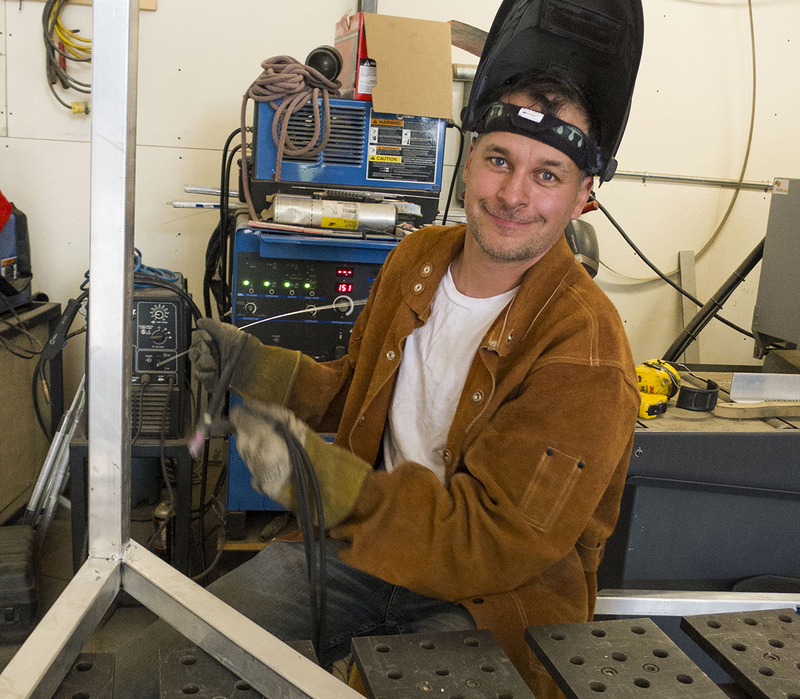 Meteek’s precision prefabbing wizard Andy Hoffman welding an aluminum framework in the shop. Andy crafts the prefabbed pieces so they fit perfectly on site around this tight corner! Just look at these sleek fittings! The fittings are modified sleek and durable stainless steel hardware from Q-railing. 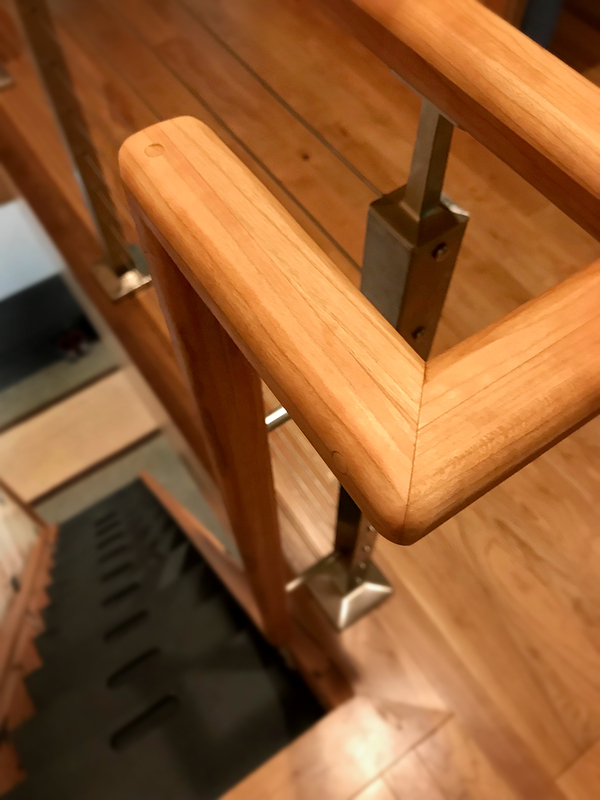 The nearly vertical railing attaches securely to the second-floor railing with cable infill, so you can make a safe transition on and off the stairs. A beautiful combination of contemporary and rustic elements make this staircase stylish and safe. You can read more about Andy’s precision prefabbing magic here, here and here. Richlite is an incredibly durable, extremely versatile and highly sustainable material made from resin-infused paper. Yes, it’s superstrengthified paper! It was originally developed over 70 years ago for industrial tooling and pattern making. Today, its applications are impressively diverse. Richlite is a premium surface material. Some of it’s applications are in the aerospace, marine, action sports, culinary, architecture, and design industries. Machine shops and automotive manufacturers also use Richlite. Handmade from many layers of high quality custom craft paper, Richlite’s surface texture comes from the natural variation in the way fibers lay within the paper. We appreciate that it contains 65% FSC®-certified or recycled paper. The remaining 35% is phenolic resin. Richlite’s color comes from a combination of the paper and the tone of the resin. Richlite performs similarly to a dense hardwood. A challenging space, innovative materials, and precision prefabbing… at Meteek, we construct the elements that express the uniqueness of your endeavors. Call us today—we are excited to hear from you!